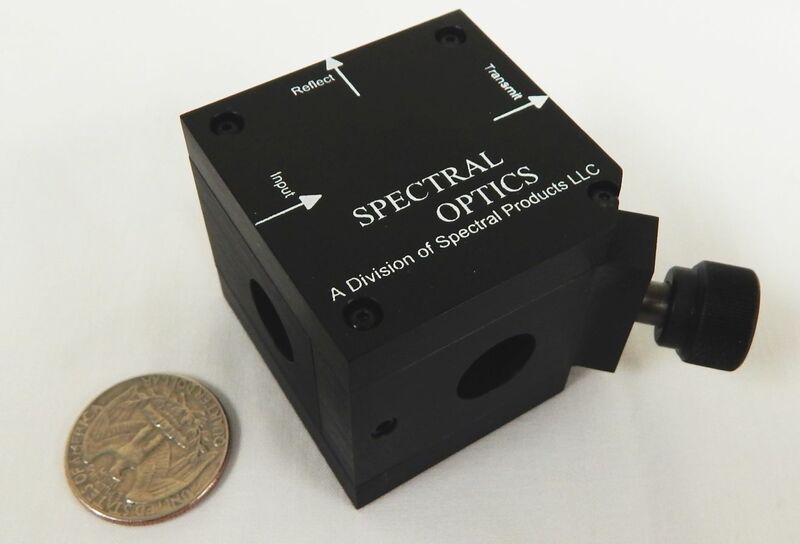 Spectral Optics (a division of Spectral Products) has developed a completely new and innovative type of broadband Variable Beam Splitter / Attenuator (VBSA) for High Power Laser Applications. Our unique VBSA offers the user continuous adjustment of the Reflection/Transmission (R/T) split ratio over an extremely broad range of wavelengths from the Deep UV at 193nm up to 10.6um in the Far Infrared. Both uncoated and coated versions of our innovative VBSA are available for any Laser wavelength and any polarization. Spectral Optics exclusive high power Variable Beam Splitter / Attenuator (VBSA) can be designed with no optical coatings over the entrance and exit apertures for use in very high power Laser applications. Due to the VBSA innovative new design, the uncoated version will maintain a laser induced damage threshold nearing the actual bulk laser damage threshold of the internal substrate materials. Due to this very unique design, extremely high damage thresholds can be maintained for most all high power Lasers operating at very specific UV to FIR wavelengths. Spectral Optics exclusive high power Variable Beam Splitter / Attenuator (VBSA) can also be used as a Continuously Tunable or Fixed Ratio Attenuator with the Transmission range typically controlled from 20% T up to 80% T (minimum of ~0% T up to ~90% T) for any UV-FIR wavelength. Offered with our Anti-Reflection (AR) coatings, the % Transmission can be controlled up to >99% T over a specific wavelength range. Spectral Optics standard VBSA Clear Aperture (C/A) standard sizes range from ¼” diameter up to ½” diameter or larger; and are available up to a 2” diameter C/A on a custom basis.